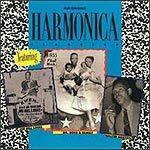 CD reviews: "Cadillac Daddy," "Sun Records Harmonica Classics" and "Low Blows"
These reviews first appeared in the November/December 1989 issue of Living Blues magazine. 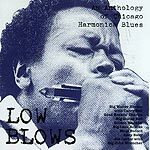 These three releases all contain numerous previously unreleased recordings, and all revolve around blues led on the harmonica. The two Rounder releases are both culled from Sam Phillips' Sun vaults, and contain recordings laid down in the early to mid-'50s. Both also contain several cuts not included on the box set "Sun Records: The Blues Years" issued several years back by Britain's Charly Records. (2002 note: The subsequent re-release of the box set on CD contained 50 additional tracks not on the vinyl version, and may include all tracks from the albums reviewed here.) They can thus be viewed as companions to the more comprehensive boxed set. The Rooster album is composed of recordings from the mid-'70s to early '80s. Tying the Rooster release closely to Rounder's Sun compilation is the appearance of Walter Horton on both, providing a look at how the passage of 20 years affected his style. The Rounder Sun compilation contains three cuts by Horton from 1952-53, including his classic single "Easy," with Jimmy DeBerry. The other two songs are the previously unissued second take of "Westwinds Are Blowing" and the until-now unissued "In the Mood." On both of these, he is accompanied by Joe Hill Louis on guitar. On the Rooster collection, Horton performs his own "Avenue Stomp" as a duet with fellow harpist Carey Bell. He is accompanied on guitar here by Eddie Taylor, so the musical backing over the 20-year span is of a consistently high quality, allowing for a fair comparison. "Easy" is probably Horton's best-known recording, but this reissue is of a particularly high quality in terms of clarity. DeBerry's incessant guitar lines and Horton's wavering, wailing harp are more clear than ever before. "Westwinds Are Blowing" features Horton on vocals as well as harp, and he displays a strong style there as well. In addition, Louis' introduction on guitar counters Horton's harmonica with an easy familiarity. "In the Mood" is, like "Easy," an instrumental. A slow but swinging blues, Horton and Louis trade the lead, swapping passages and themes as the melody switches from one instrument to the other. "Avenue Stomp," recorded two decades after the earlier material, finds Horton still in excellent shape. His playing is as loose and fluid as when he was a younger man. He blends his style well with Taylor's personalized rhythm on guitar, as well as Bell's harp, which is much more sparse. Unfortunately, the recording quality on "Avenue Stomp" is not up to the Rounder/Sun standards, even though it is a generation newer. Which brings up the major complaint with the Rooster album  the sound quality is uneven; very good on some songs, it has a noticeable, irritating hiss on others. But the breadth of material makes up for the poor recording quality. And each song included here is previously unavailable. Outside of Horton, the highlight of "Low Blows" may be the lone cut by Easy Baby (Alex Randall). On "Good Morning Mr. Blues," Easy's light touch and high tone on harmonica are matched by his vocals for an original sound. Easy's exquisite timing, with the pauses never overextended nor rushed, also adds much to the song. Backing Easy is guitarist Walter "Big Guitar Red" Smith, whose clean leads and between-lyric fills complement Easy well. Red sings the first song on the album, "Found My Baby (Gone)," a Jimmy Reed composition, accompanied by harpist Good Rockin' Charles. Charles' deep, resonant harp is a good offset to Red's crisp guitar work and nasal vocals. Although the Rooster album is labeled a harmonica anthology, there is a wealth of excellent guitar and vocal work here as well. To overlook these performances in the zealous pursuit of listening to the harps would be a shame. Red and Charles team on two other songs: "She Loves Another Man" and "Ground Hog Blues." On both, Charles handles the vocals in addition to the harp. His voice is weaker than his harmonica's sound, yet still expressive. "Ground Hog Blues" is the most uptempo of the duo's cuts, with Charles' energetic harp interplaying with Red's spare guitar playing. Big Leon Brooks also has three songs on this album. Like Red and Charles, his songs are spread across the CD, rather than grouped together  although in each case all the material by any one artist is taken from the same recording session. On "Kicking Up Dust," Brooks exhibits a smooth, melodic style on harmonica that nevertheless moves along quickly. Brooks' harp seems to be full of ideas that come tumbling out almost faster than he can play them. Freddy Robinson's hollow-body guitar adds a richness to the harmony, and he gets to solo some as well. Brooks' best contribution to this album is his second cut, "Pink Champagne." Although at times he sounds like James Cotton, the song itself is memorable and Brooks switches comfortably from his baritone vocals to his equally deep harp. His final song, the self-penned "You Know," has a forgettable melody but he turns in yet another fine performance. Mojo Buford makes a cameo with "Don't Go No Further," in which he is given room to extrapolate his slow-paced, rich brand of blues. Here, too, is excellent guitar playing from Sammy Lawhorn, who lays out a syncopated lead during his solo. The album is rounded out by two cuts from Golden Wheeler ("Good Lover" and "Evil Woman") and one by Joe Carter and Big John Wrencher. Wheeler's rich, harmonious voice, set against Bobby King's multi-layered guitar work, makes both songs special. Wheeler plays harmonica with a gravelly sound that is in marked contrast to his smooth singing. Carter starts his effort with Wrencher by engaging in a game of guitar tag with Big Guitar Red. Red then steps back, where he is joined by Wrencher on harp, while Carter leads the band with his fretwork and vocals. The Rooster compilation is a strong one, well worth owning. The in-depth liner notes give comprehensive biographical information on the artists. The Sun compilation from Rounder has material just as strong as the Rooster release, and with better sound quality. One-man band Doctor Ross maintains the pace set by Horton (as mentioned above) with "Jukebox Boogie," a rollicking uptempo instrumental with strong interplay between his harp and Tom Troy's guitar. A previously unissued second take of "Jukebox Boogie" is not nearly as energetic as the first. Although more polished, this version lacks the passion that ignited the first version which was released by Sun as a single. "Downtown Boogie," recorded at an unknown date, shares the melody with "Jukebox Boogie," as well as the same rhythm. The harmonies are changed up, though, as are the lyrics, and Ross' harp playing is hotter than on either cut of "Jukebox." Coy "Hot Shot" Love's single, "Wolf Call Boogie," leads off the second side of the Sun compilation. While loves takes front and center with his singing and harmonica, guitarist Pat Hare and pianist Mose Vinson join bassist Kenneth Banks and drummer Houston Stokes in laying down a steady foundation around which Love weaves his improvisations. An unissued third take included here is very different from the single. A narrative intro gives us a tale of a man out drinking and womanizing, before Love begins blowing his harp. Hare then joins in, setting down a pulsing rhythm on guitar. In between the two takes of "Wolf Call Boogie" is "Harmonica Jam," dubbed off of a 78 as the master tape is apparently lost. The sound quality suffers in comparison to the rest of the album, but remains listenable. This tune shows Love at his brightest  moaning and talking through his harmonica. Hare's guitar work gives his version of the story Love is telling, and is one of his better recorded performances. Love's contributions were recorded in 1954, whereas the material on Side One was recorded from 1951 to '54. This semi-chronological order continues with the Sammy Lewis-Willie Johnson tune "So Long, Baby Goodbye," which was laid down in 1955. This funky song was influenced by what was going on in popular black music at that time, specifically R&B. But if not blues in a strictly traditional sense, the musicianship more than compensates for a lack of stylistic purity. Johnson's strong vocal is set against Lewis' nasal harp, with L.C. Hubert's piano contributing equally. Johnson and Lewis really go to town with an improvised duel between harp and guitar. Joe Hill Louis finishes out this album, upsetting the chronology in the process: all three of his tunes were recorded in 1952. Louis' reputation as a one-man band is reinforced here as he plays harmonica and guitar, in addition to his singing. He is joined by Albert Williams on piano and Willie Nix on drums. "Got Me a New Woman" is more urgent, and the playing a little tighter, than the preceding "Keep Your Arms Around Me Mama" (both of these were previously unissued). The third Louis song is his single, "She May Be Yours (But She Comes to See Me Sometimes)." This is another dub from a 78 and the sound quality suffers tremendously, although Louis' harp introduction remains noteworthy. The Sun compilation is a good introduction to a unique time and place in blues history. 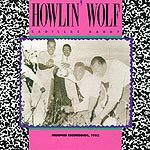 The Howlin' Wolf album is pulled from Wolf's earliest recordings, laid down in Memphis in 1952. All of the elements that made Wolf great are present here: the gruff, gravelly voice; the smooth, accessible songs; and the tight arrangements and playing. About two-thirds of the songs here were included on the original vinyl release of Charly Records' Sun box set. (More may have been included on the CD re-issue.) That still leaves a third that have never been available before. Of these, "Oh, Red! (Take 2)" is the most interesting. Wolf is backed by a horn section in addition to his usual blues lineup. A sophisticated, polished number, "Oh, Red!" shows another side of Wolf, as his singing is almost in a jazz vein. Adding to that feeling is a long solo by an uncredited tenor saxophonist. "My Last Affair (Take 1)" is a more typical Wolf song, with painful, drawn-out vocals telling a story of heartache. "Everybody's In the Mood," culled from the box set, is a pre-rocker that shows where the rockabilly artists got their influences from when they wandered into Phillips' Sun studio a few years later. The jumping rhythm and melodic leads would have been at home on a Chuck Berry session. Wolf's harmonica is not forgotten here, either, although on several cuts the mix makes it hard to hear him blowing. "Drinkin' C.V. Wine" is the highpoint on harmonica here, with an impassioned wailing that shows Wolf in top form. But Wolf was already at his artistic peak when Phillips recorded him, and these early tracks show why he was already drawing much acclaim even if his fame had not yet spread.